Dimensions 20.0 In. X 22.0 In. 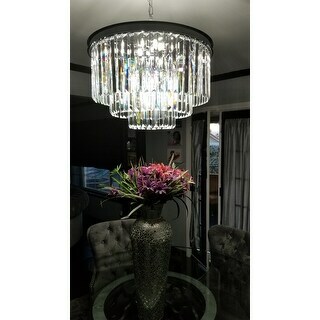 It took me a long time before deciding to pull the trigger on purchasing the chandelier, as there were not enough detailed information in the product description and limited number of photos on line. Sadly, when we took the existing chandelier down to install this one, we found that our current structure will not support the weight of this heavier chandelier. So we faced the dilemma of either having to strengthen the support, which means cutting into the ceiling, install a new piece of wood, re-drywall the ceiling, etc. lots of work, or returning. We did not assemble the chandelier, but the individual crystal pieces are very nice. However, the round ring is thin, flimsy and rather cheap looking. It has visible join. I suppose It is expected at this price point. 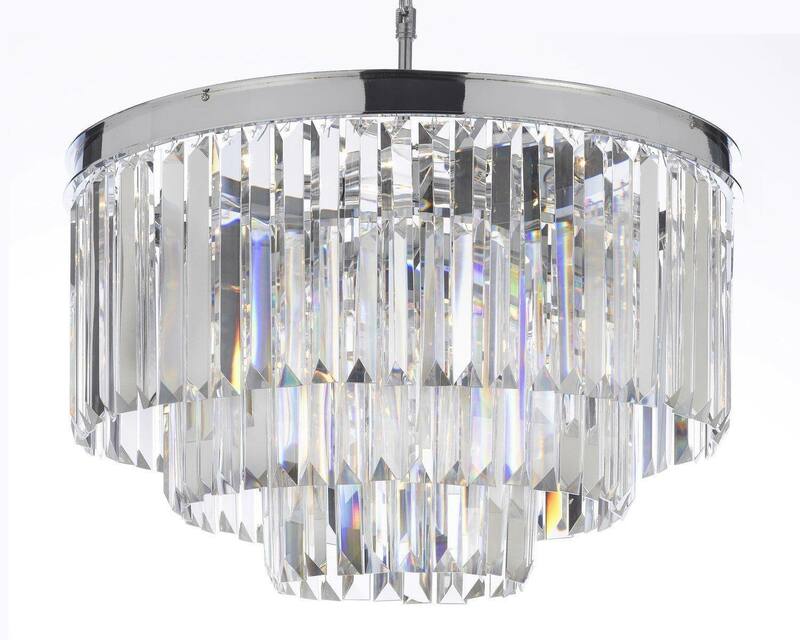 I am very happy with this chandelier especially for the money! It looks much more expensive in person. The one item people should be aware of is the chrome base is not flat like it looks in picture - it has a lip at top and base. I wish it was flat all the way around the base like the picture shows. I still love it though! It is not worth complaining about but wish I knew it before I ordered. Anyway, it sparkles- glass pieces are quality! Same as *** , better price. Purchase the installation because I didn't and installation was very tedious and takes patience and time. I have provided pics of installation just in case. Love this chandelier!! Impressive! Made the whole room look elegant. Really beautiful for the money!! Item as described. Would have given a higher review, but having to put all the crystals on with the little wire for mounting is time consuming and leaves a lot of room for error. Very expensive looking and really well made. "How long is the wire and the chain please?" 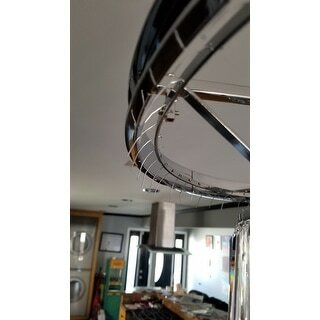 "What is the stem length on this from ceiling to top of fixture? I have high ceilings and want to make sure it fits the room." "Can you put this light on a dimmer?" Yes we did and it worked great! "What is the weight of this light fixture? Thanks." "How long is the chain and how long is the wire?" 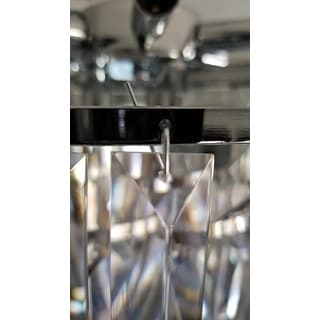 Yes - I have this fixture and it is on a dimmer- and it's fabulous! "What are the differences between ITEM# 18534398 and ITEM#: 18534382? Is one smaller than the other? Metal ring finish, chrome vs darker finish?" The finish. One is chrome other is silver/grey.